Welcome to Part 2 of the end-of-season NBA Review. Part 1 is here, if you like laughing at losers as much as I do. The 15 teams that have clinched playoff spots as of Tuesday morning will be listed here. Orlando Magic: My editor, while we were digging out my new gooseberry patch on Saturday, remarked to me (in between gasping lungfuls of air, leaning on his shovel) that he didn’t want to see the Magic in the playoffs. Their brand of basketball is boring, their roster is mismatched, and out of all the dregs of the East, they’d give the top teams the least amount of trouble. I’d agree with most of that, but on the other hand: Orlando has been trying so damn hard to make the postseason, and the veterans on that team (impending free agent Nikola Vucevic, Aaron Gordon, Evan Fournier) have been on crappy teams their whole careers. The Magic may not be appointment viewing unless you like snazzy uniforms, but it’s easy to feel good about these guys finally getting their first taste of the postseason. The future is pretty murky for the Magic, mostly about whether to keep Vucevic and keep chasing seventh seeds, or let him go and let the swarm of long-armed youngsters (Jonathan Isaac and Mo Bamba, specifically) try their hand at center while the team descends back to the lottery. Making the playoffs this year is an achievement, but it ironically also might undo their team by overpaying Vooch and leaving their young guys to play out of position, and rot on the vine so to speak. Brooklyn Nets: This team is another feel-good story. The Nets have had troubles this season, sure—Caris LeVert suffering that scary leg injury, briefly falling out of the playoff picture after spending most of the season squarely in the sixth seed—but those issues pale in comparison to the gigantic mess Sean Marks has had to clean up. Thanks to the ineptitude of Billy King, the Nets haven’t had a lottery pick in years despite being an abjectly awful team. Making all those win-now trades (including trading for Gerald Wallace, giving up the pick that would become Damian Lillard) let the cupboard bare, and forced Marks and Co. to use creative means to acquire NBA talent. Taking a flier on D’Angelo Russell (via trade), drafting question marks like Jarrett Allen and LeVert with their mid-late 20s draft picks (due to pick swaps with the Celtics), and betting that they can get the most out of fringe rotation players like Spencer Dinwiddie—those are the paths that a team as handicapped as the mid-late 2010s Nets had to take. This season, all that maneuvering paid off with the sixth seed, and a likely date with Philadelphia in the playoffs. And this summer, Brooklyn can sign some really good players in free agency; pitching the glamour of living in New York City, without all the BS that comes with the Knicks, is a good idea. How the Hell Did You Survive Another Year? Los Angeles Clippers: So, after trading their best player, fielding a team full of scrappers and isolation scorers, and playing in the hypercompetitive Western Conference, the Clippers found a way to make the playoffs. Uhhhh…wha? How they did it is through a career year from the eternally snakebit Danilo Gallinari and a world-class coaching/politicking job from Doc Rivers. Montrezl Harrell and Lou Williams head a bench mob that’s been ravaging second units across the league like a five-man Genghis Khan, but that depth means little without some high-end scoring ability from Gallo and Lou, and the acumen of a veteran coach like Rivers. This summer will be all about wooing Kawhi Leonard to provide the top-five player that could push this roster to true contention in the West, especially if the Warriors splinter apart. San Antonio Spurs: Seriously, the Spurs are like the Jason Voorhees of the NBA. They just. Won’t. Die. And this extremely savvy team is probably going to face the extremely callow Denver Nuggets in the first round. Hell of an education for Nikola Jokic, Jamal Murray, and the rest of Denver’s youngsters. Oklahoma City Thunder: After going into a tailspin right into the eighth seed, OKC has recovered somewhat and clinched the sixth seed—and guaranteed themselves a Warriors-free postseason until the Western Conference Finals. That’s good, since a team with Paul George and Russell Westbrook always has a chance against any team that’s not the Golden State Warriors (and even then, they can give those guys some trouble), but there’s a problem: PG’s shoulder. The reason they went into that tailspin was because George struggled mightily to power through a shoulder issue, and his shooting suffered. With Westbrook being his usual inefficient self, and the rest of the Thunder being the usual collection of non-shooters (and there’s way too much Raymond Felton going on in OKC), anytime George has problems, the Thunder are sunk. Oklahoma City is praying George is healthy and that they get Portland instead of Houston in the postseason; you always prefer playing mere mortals like Lillard instead of human flamethrowers like James Harden. Indiana Pacers: The Pacers’ style is well-suited for the postseason, grindy and slow, valuing every possession like a firstborn child. A Nate McMillan team distilled into its purest essence. That glacial pace may have worked when Brandon Roy was patrolling the Rip City hardwood, but for his current team, who’s the one guy who will go get them a bucket when they need it most? Bojan Bogdanovic? Domantas Sabonis? Tyreke Evans (gulp)? It’s cute to compare the Pacers and Clippers, but where the Clips have two really good isolation guys in Williams and Gallinari, Indy has nobody cut from that cloth—unless Bogdanovic has another level to him. If the Pacers are going to make noise this year, he’ll have to find said level. This is where Victor Oladipo’s injury will hurt them. Boston Celtics: Marcus Smart said it best awhile ago: the Celtics have too many guys. There are so many agendas clashing here: Jayson Tatum wants to unleash his inner Kobe, Kyrie Irving wants to be THE GUY on an egalitarian team with an egalitarian coach, Marcus Morris wants to start no matter how badly he’s playing, Gordon Hayward wants to find his mojo 18 months after his ankle shattered, Terry Rozier is playing for a contract, Jaylen Brown wants a clearly defined role (that one is Brad Stevens’ fault, honestly)…just so much going on. Maybe they rally together in the playoffs. Maybe they get behind Al Horford and Smart, two guys who defend like hell and are glue players. Maybe they shatter if they get behind the Pacers in the series, and Danny Ainge decides Irving is a sunk cost and doesn’t even tender an offer to him. Everything is on the table. I’d bet on them out-talenting the Pacers, then running into the Bucks’ buzzsaw. Utah Jazz: Last year, the Jazz surprised the Thunder in the first round before falling to the Warriors. Their roster is especially susceptible to the Warriors’ small-ball shenanigans, since both Rudy Gobert and Derrick Favors are not the best at chasing around smaller players on the perimeter and Golden State will draw them out there with all that shooting. I suppose Draymond Green could be a good hiding spot if he’s just standing out near the three-point line, but he can both handle the ball and pass; he could just drive right at Gobert and break the Jazz defense that way. That’s even assuming Utah can score enough to keep up with the Blazers, their presumptive first-round opponent. The Jazz don’t have so much a flaw as they have a deficiency in their roster, no matter how good Donovan Mitchell is. They’re like the Blazers: a solid, capable team that doesn’t have two or three superstars on it, and thus is always left in the dust. Denver Nuggets: Their youth and late swoon cast doubts on their ability to succeed in the postseason, but even if they flame out against the Spurs this year, the Nuggets are here to stay, Jack. They do have to work something out with Paul Millsap in the summer, and they need both Jamal Murray and Gary Harris to get even better (and stay healthy), but as long as the Joker is manning the middle, Denver will be a solid playoff team. Whether they become something more (they aren’t sneaking up on the Association again) depends on the players around him, and how much he can amplify their strengths and cover for their weaknesses—and vice versa. 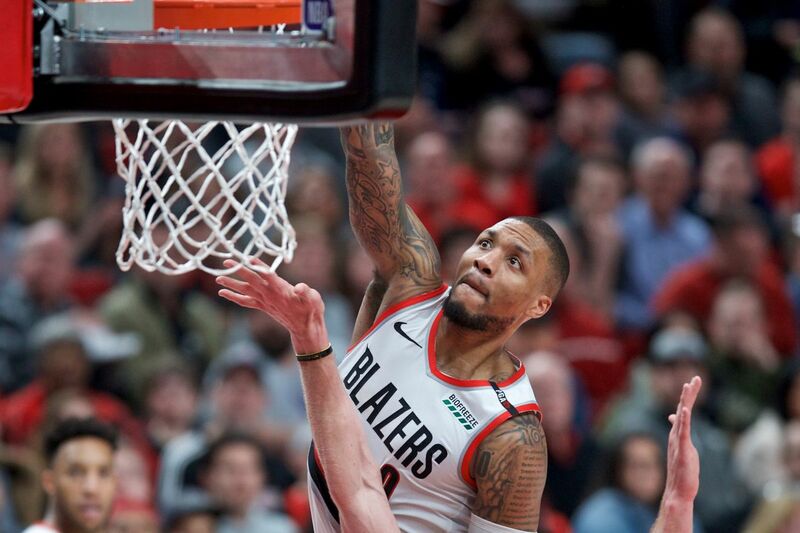 Portland Trail Blazers: It can only be imagined how good the Blazers would have been in the postseason with Jusuf Nurkic playing like he was this season. Their quest for redemption had a good chance of succeeding against Utah, and even though they’d just run into Golden State, again—and get their asses kicked, again—it still would be a fairly successful season and set them up for success later when the Warriors as we know them won’t be around. Winning last night—and the Rockets losing—helped, but their outlook isn’t any rosier against the Thunder, a team that’s been beating them up all season. Instead, with Nurkic’s devastating broken leg, we won’t get that version of Nurkic back for at least two years—if he can ever reach that level at all. The injury he suffered is said to be similar to the broken leg Paul George suffered years ago. While George came back and eventually exceeded his previous production, it took him years. It’s reasonable to expect the same where Nurk is concerned. We’ll go into the Blazers’ playoff matchup in detail later this week, but they will be an underdog in whatever series. In the meantime—Nurk, we love you, and get yourself right. Philadelphia 76ers: I put them here because their starting lineup of Joel Embiid, Ben Simmons, Tobias Harris, Jimmy Butler, and JJ Redick is good enough to beat anybody…when the Sixers can work together. The Sixers are abandoning the Process plan and are on the talent grab plan, or what I like to call the Whitsitt Plan: get as many good players as you can, abandon the coach to his own devices, and hope it works out. Unlike Whitsitt’s Portland teams, however, Philly is as thin as a dieting starlet. Their three best reserves might be Boban Marjanovic, TJ McConnell, and Mike Scott. Even the starting lineup has a glaring hole in Redick, who’s starting to show his age; he’s back to getting mercilessly picked on when the Sixers are on defense, and the team doesn’t seem to be cohesive enough to hide Redick consistently. There’s still something missing in Philly. Whether that’s their need for a better coach, Simmons being too unique for his own good (and his team’s), the sacrificing of their depth for two wings that can cut bait this July…something is just off with them. Embiid’s dominance, and the magic of the Bobi and Tobi ship, can only carry them so far. Houston Rockets: James Harden is a cross between Neo, God, and Michael Jordan, and somehow it’s almost boring to watch. He’s the very definition of “brutally efficient,” with a steady diet of stepback threes, free throws, layups, savvy passes that bend the defense like Superman bends steel, and—when all else fails—an unblockable floater that just reinforces how unfair this guy has become to guard. The only hope the NBA has at this point is that Harden does the Barkley: exhaust himself in the postseason and become so inefficient that he’s an active drain on his team. Given the immense burden Harden has had to carry this season, with everyone else around him suffering injuries and through inconsistent play, the smart money is on the Beard flaming out. Who knows, though—the one year that Charles Barkley didn’t totally run himself into the ground, his MVP year in 1993, he carried the Phoenix Suns to the NBA Finals. Harden is good enough to do what Barkley did 26 years ago. The question is whether facing the Western gauntlet, with a rematch against the Warriors looming in the Western Conference Finals, will get to him like it always has. Toronto Raptors: It’s time to see if the load management plan for Kawhi Leonard is going to pay off for Toronto. They took a risk in trading for him, both because of his famously fragile quads and his equally famous desire to play in Southern California. The regular season has gone almost as planned. Milwaukee snagged the first seed—and home-court advantage throughout the entire postseason—but the Raptors avoided major injury, played well when Leonard and Kyle Lowry had to rest/nurse injuries, developed their young depth (Pascal Siakam is going to be extremely good, extremely quick), and they have as good a shot as any team to not only win the East, but challenge the Warriors. The training wheels are officially kicked off of Leonard, and he’s about to run roughshod over the East. I really want a Bucks-Raptors series to happen. Milwaukee Bucks: The Bucks have home-court, the presumptive MVP in Giannis Antetokounmpo, a stellar coach in Mike Budenholzer, a very deep team of their own, and a three-point barrage that has made Antetokounmpo nigh-unguardable. The only problem they might have is their relative lack of deep postseason experience—only rarely used center Pau Gasol has been out of the second round—but this team has been to the playoffs plenty already, experienced failure, and has risen to become an all-consuming force. I would be inclined to favor the Raptors slightly in a series between those teams, but the Greek Freak is going to be the best player in any series he plays that doesn’t include Huston or Golden State—and that’s a maybe with both those teams, as well. And if there’s one tried-and-true postseason truism, it’s this: Always bet on the team with the best player in a series. Golden State Warriors: The last hurrah for Oracle Arena. The last time we’ll (probably) see Kevin Durant in a Warriors jersey. One of the last seasons Draymond Green will be fairly paid. The first time DeMarcus Cousins will see playoff action. Lots going on down in the Bay. I’d still take the Warriors over the field, but I wouldn’t be stunned if the Rockets, Raptors, or Bucks unseat them. Either way, this current era has all the signs of being finished the minute the clock strikes 12:01 AM, July 1. Will the Warriors be able to be this dominant without Durant? Will they find a way to replace their aging role players and keep Klay Thompson and Green happy? Will they even find a way to improve upon their team, which sounds impossible but could happen? I don’t know the answers to these questions. All I know is that this team will go down as one of the true dynasties of the NBA, that quite a few of its members (and coach Steve Kerr) have places reserved in the Hall of Fame, and that they’re the favorites to win this year’s NBA championship. Jared Wright is a Portland Trail Blazers writer for Oregon Sports News, though he also writes about other stuff when the mood takes him. He also apparently enjoys talking about himself in the third person. He lives in Southeast Portland.